Julian King from Rider Levett Bucknall UK (RLB UK) says planning authorities need to create the right blend of public realm, agile space and heritage to ensure the future of their urban centres. From the rise of out-of-town sheds, the apparent demise of the high street, the growth of online shopping and the consequential increased need for warehouse and distribution centres, retailers have had to react quickly to keep up with their customers’ needs and demands. The impact of this changing shape of retail on town centres has been phenomenal and in some cases catastrophic. However, following on from successful leads by town centres like Bolton and Kingston, council leaders are beginning to see a new pattern forming with ‘place makers’ from professional disciplines being hired to help develop local policy and give guidance to form masterplans and roadmaps for town centre regeneration. Community-led investment where local businesses and community leaders are actively involved in the regeneration of their town centres is becoming the norm. Looking at how we balance private commerciality with public power will drive new and exciting challenges for those in local authorities. Chris Fowler of The Local Data Company noted that if 40% of all retail vacancies are empty for periods of over three years, it is symbolic that change is needed, and fast. Local authorities need to seek strategic partnerships to look at their conurbations against the needs of their communities rather than working in silos of retail, housing and leisure. At RLB we are seeing a new partnership approach being played out at a host of schemes in the most historic yet deprived town centres where innovative and local demand-led projects are gaining both public credibility and, most crucially, central government backing. Many of the developer-led projects such as Cardiff’s Tramshed, illustrate how the boundaries of living are blurring with open, dynamic and bright work/live spaces, injecting investment into previously unutilised spaces. Far from destroying the history and heritage of a town, new ways of thinking are bringing former town centres back as the hub of their communities. As change comes from the evolution of our demand and usage of town centres, so must change take place at a policy level. Local structure plans and planners need to make their town centres attractive to the young people who otherwise will seek higher pay and better opportunities in other towns and cities. Making sure the community is engaged, and communication of what the future of the town centre may look like is the key to encouraging confidence, pride and entrepreneurship. Local authorities need to look at obstacles as well as opportunities that are driving their footfall figures. I listened to an enthusiastic Beverly Owen, Director of Place at Newport City Council at the aforementioned Summit, talk about the Government’s decision to remove the Severn Bridge toll charge on the M4 by the end of 2018 and the projected impact on the surrounding towns such as Newport. She estimated that this strategic policy change would drive approximately 25m additional visitors to the area, bringing with it the creation of new commuter zones in South Wales. The opportunity for success will not just be dependent on cars from the M4 Corridor, but will depend on other complementary infrastructure, transport and travel links. It is important for local authorities to become first movers when presented with opportunities such as this and sow the early seeds of change. Design can play an important part in ‘place making’ through innovative lighting schemes, providing green spaces in unexpected urban spaces and green walls or roofs. However, no amount of clever design can substitute for bringing the community back into town. Combining doctors, dentists, community halls, libraries, leisure and food venues are critical to attracting a blend of new opportunities in our town centres. If helped along by a good local communication and engagement strategy together with an active Business Improvement District, the formula for success can be derived from a complex set of variable factors. 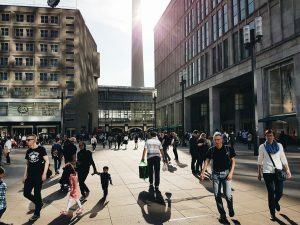 Where these critical factors all align, town centres have seen a huge ‘lettability’ advantage for commercial and retail landlords, with developers seeing up to a 35% uplift in footfall and customer spend in schemes where an environmental and health and wellness remit has been addressed. SKA rated projects that RLB has delivered have had a specific focus on enhancing sustainability and wellbeing, resulting in a 44% reduction in staff churn for occupying employers, showing the connection between a space and the wellbeing of those working within it. As we move to a world where we can work, play and live within a ‘stone’s throw’ of one another, town centre developers and local authorities need to place the community experience at the heart of their approach. Making our town centres desirable again is a huge challenge, and yet presents one of the biggest opportunities for local authorities. If delivered well, with customers and communities in mind, it could prove to be the best and most commercial move made by local government for generations to come. The revised National Planning Policy Framework — a brave new (planning) world? Is red tape the biggest barrier to government target of 300,000 new homes a year?